The Web-Based Work Request Program will allow anybody in your organization to submit a work request using Intranet. A requester enters his/her name, telephone number, email address, location of the job and description of the problem or work request. Once the requester clicks on the Submit button the information electronically goes to the GRAND-PM database creating a new work order. At the same time the program sends an email message to the requester acknowledging the receipt of the work request. The email message sent to the requester also contains a URL (link) to the page for the newly created work order. Therefore, at any time later, the requester can click on this link and check the status of the submitted work order. In the GRAND-PM program Work Order module, a person responsible for processing work requests periodically checks for newly submitted work order requests. When a work request shows up in the GRAND-PM work order file, the person processing this information can assign the work order to an employee, shop, and other fields in the GRAND-PM. Also, optionally, field Open Work Order Status can be assigned a user-defined entry. This entry is seen on the web page the requester may view to check on the status of the work order. When the work order is closed, an email message is automatically sent to the work requester to notify them that the work has been completed. 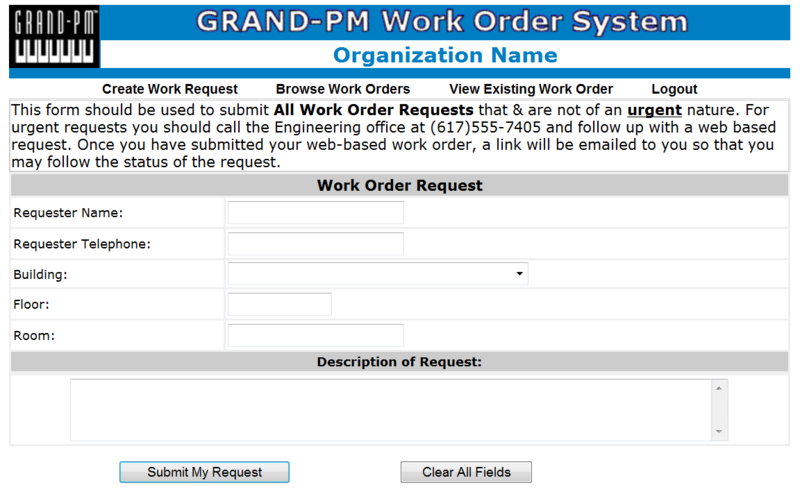 Click to view a sample screen from GRAND-PM Web-based Work Request program.